With unanimous excitement the NACCS Board announces Dr. Rosaura Sánchez as NACCS Scholars 2018 and forever after. Hers is a tale of commitment, tenacity, and perseverance that provides a context for the labor of NACCS. 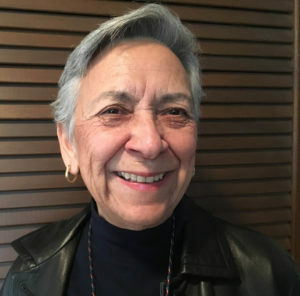 Dr. Sánchez began her educational pursuits in 1959 attending the UT at Austin, where she earned a B.A. in Spanish (with a minor in English) in 1963. Following her BA she entered the Peace Corps where she served as an ESL and Literacy Instructor in Ecuador from 1964-1966. Among her professional experiences early in her career, Dr. Sanchez served as a Language Instructor in the Peace Corps Summer Training Programs and Teacher Corps at USC Rural Migrant 1967-1970, and 1969-1971 respectively. In 1969 she completed an MA in Spanish and in 1974 a PhD in Romance Linguistics also at the UT at Austin. Her dissertation entitled: A Generative Study of Two Spanish Dialects. According to Dr. Mary Pardo, Sánchez’ “impressive record of contributions, including scholarly work, academic preparation of new scholars…, political stances against injustice, and creative writing represent a life achievement…What is most impressive to me is the consistent rigor of her arguments and ability to engage in contemporary political reflections….my most respected colleagues in Chicana/o Studies at CSUN, include Alicia Ivonne Estrada, PhD., who Sánchez mentored when she was an undergraduate student…Sánchez’ life achievements embody NACCS central mission-a lifetime of critical inquiry regarding the Chicana/o/Mexican/ experience and engagement in contemporary political debates. Nominated by the N. CA Foco and received support from former students, Dr. Lomas (Colorado College), Dr. Flores (U of Washington), Dr. Fregoso (UC Santa Cruz) and a colleague from the S. CA Foco, Dr. Pardo (CSU Northridge).